But will the new anti-cheating software ruin the fun? Microsoft’s TruePlay is just one of dozens of features debuting with Windows 10’s Fall Creators Update, but one of the few Microsoft didn’t really talk about. Thanks to a rather technical MSDN support page Microsoft posted, we now more about this anti-cheating technology for PC gaming, built right into Windows 10. What this means for you: Anti-cheat software isn't new, but TruePlay marks the first time it's been built natively into Windows 10. The market for Windows Store games is a much smaller market compared to, say, Steam (which has its own Valve Anti-Cheat tech), so it's hard to know how much TruePlay will be used. Still, gamers have to wonder how TruePlay might spoil the fun with its own intrusive anti-cheat tactics. We'll have to wait and see. TruePlay: An optional anti-cheating tweak, or not? You can find TruePlay within the Windows 10 Settings > Gaming menu. TruePlay is clear about its mission in the setting's description: “Gaming is more fun when everyone plays fairly,” Microsoft says. TruePlay is actually off by default, at least within the Windows 10 16299.19 build. Opting out could have consequences, though: “Turning this off may limit the games you can play,” the description adds. To ensure fairness, TruePlay will be watching your behavior while you game, the description explains: "We’ll share info with games using TruePlay to make sure everything runs the way it was meant to." The support page adds more under-the-hood detail. "A game enrolled in TruePlay will run in a protected process, which mitigates a class of common attacks," the page explains. 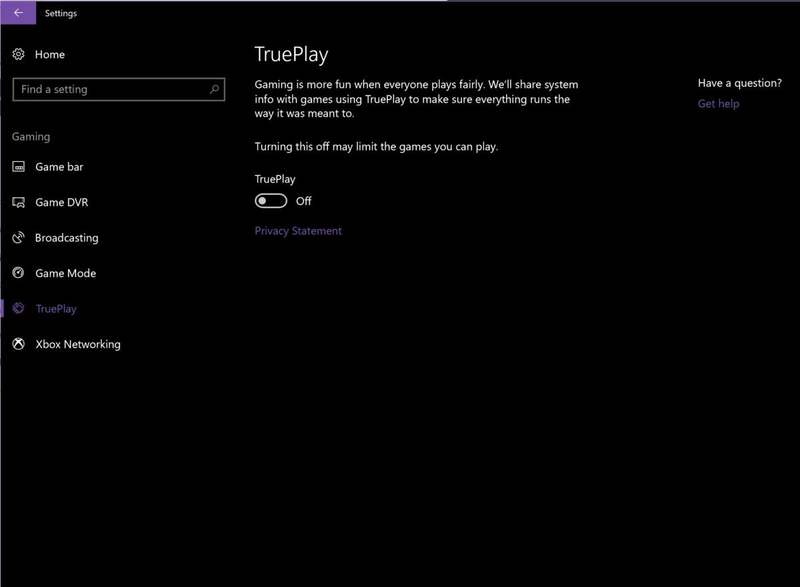 TruePlay will also watch gaming behavior for signs of cheating: "A Windows service will monitor gaming sessions for behaviors and manipulations that are common in cheating scenarios." TruePlay is not a “block on launch” experience, Microsoft says, so even if a customer opts out and toggles off TruePlay, he or she should still be able to launch the game. “Developers may have some game features and experiences which do not require active game monitoring,” Microsoft says. Of course, those “experiences” could be something totally outside the gameplay itself, such as videos that explain the events leading up to the Battle of the Bulge, for example, or perhaps some interaction with social media. A developer could choose to make TruePlay part of the core experience of actually playing the game, for that matter—it’s all up to the developer. It also looks like TruePlay may not work with many games. Microsoft refers to the TruePlay APIs as “TruePlay APIs for the Universal Windows Platform (UWP),” implying that TruePlay will apply only to UWP games sold through the Windows Store, of which there are relatively few. That would suggest that traditional Win32 games sold through Steam, for example, wouldn’t be governed by TruePlay. So far, we've not seen any developer come forward and explicitly support TruePlay with upcoming games. It’s telling, though, that even PC game companies have been leery of implementing new anti-cheating technologies for fear of breaking the game itself. One anecdotal example: A user complained to Electronic Arts that PunkBuster, a controversial anti-cheating technology, had prevented him from joining games after a Windows security update.